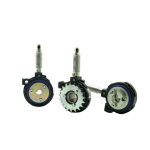 Trimble Tru Count clutches provide shutoff capabilities to your planter, regardless of whether it is ground-driven or hydraulically controlled. With the Tru Count electric clutch, you can outfit your ground-driven planter with sectional control, allowing the hex shafts to turn only when you need them. Or, you can attach a Tru Count pneumatic clutch to each meter and create 3-row sections, 2-row sections, or single-row control. Like most equipment exposed to dusty, harsh conditions, the air clutch does benefit from simple routine maintenance. You can often ‘get by’ for a few seasons by using compressed air to remove debris from the clutch housing before applying silicone lube in the housing (not in the piston! )—but eventually, it is prudent to disassemble the clutch for a more thorough cleaning and inspection. Because the air compressor is also exposed to the elements, purging water from air-storage tanks and cleaning breather filters is recommended, as is applying a drop of compressor oil to each clutch piston (not in the housing!) to provide proper lubrication. Many growers have a desire to re-use air clutches and controllers from one planter to another. Most of the parts are the same between kits, so adding a bit more air line or another section module to your planter is pretty simple. If you want to swap planter brands, or you are changing from a chain-and-sprocket drive to a cable-drive style, the clutches and clutch hardware will be different. Sometimes you can have the “guts” replaced—sometimes this is a cheaper route, and sometimes it is not. Contact us if you have questions!